Le tour de France is one of the three biggest cycling events in the world. It takes place mostly in France, but starts at a different city every year. This year the grand départ came back to Holland for the sixth time; a record! Utrecht was the elected city to host the event. How did the city of Utrecht get this event to take place in their city and how can you prepare for an event this big? I went to a press presentation where I got all these questions answered. It wasn’t easy to get the event to take place in Utrecht. It took the city 13 years; from the first idea written on a beer coaster to the actual event the beginning of July 2015. 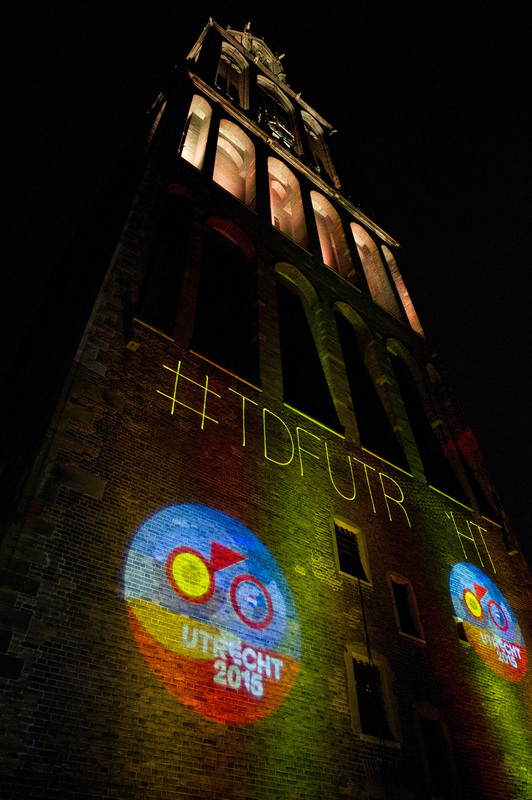 With a few setbacks, it wasn’t until a few years back it became clear Utrecht would be the host of the grand départ 2015. It wasn’t a coincidence that they chose the year 2015. It’s the perfect year to do this: there are no Olympics, World or European Championships. Everyone is focused on the tour as the biggest sport event of the year. It makes for maximum publicity. To get most out of the event Utrecht decided to expand the festivities from 3 to 100 days. Because, why not? All kinds of smaller events are organised that are in line with the cycling event. Think of sport days with primary schools and local cycle contests. The scale of this event is enormous. Beforehand they expected 300,000 people, newspapers reported after the event that 350,000 people came to watch the grand départ. That’s a lot for a small city that is only used to events, for example King’s day, with 100,000 visitors. Together with local business owners, inhabitants and volunteers the city of Utrecht organised the event. Every little detail is taken care of: from enough water taps to garbage disposal to age bracelets to prevent underage drinking. From 19 till the 23rd of August, Amsterdam was the centre of the nautical world during SAIL 2015. What started out as an event to celebrate Amsterdam’s 700th jubilee in 1975 has evolved to one of the biggest events in the world. This year, nearly 2.3 million people enjoyed the event to the fullest: the Tall Ships, the heritage ships, all the cultural events and the entertainment, the innovative ‘Oceans’ structure, the National SAIL debate and the relaxed atmosphere. And ijVENUES was right in the middle of all festivities! Despite all the security measures taken because of the huge public event at the doorstep, three major events were organised at ijVENUES. If this is possible, everything is possible, right? The 3 events that were organised all had their own specific character and audience. For starters ijVENUES was the host for the SAIL organisation and served as an official press location on the Main Deck. Meanwhile a themed Marina Club event took place on the Terrace and restaurant, a sort of VIP deck for corporate groups. And last but not least an international conference was planned in the Auditorium! Watch the video below and have a look how huge the event was, how ijVENUES served over 5000 guests and why you should consider ijVENUES as a partner for your next event. During SAIL 2020 or any other time! Good to know: ijVENUES can host conferences up to 1900 people.